Located within the most desirable part of the City Centre, Greyfriars Court is a perfect apartment for those looking to access the best bars, restaurants and venues that Glasgow's Merchant City has to offer. The apartment is located on the first floor of the building. Security entry leads to a communal stairwell which brings you to a beautiful internal courtyard as photographed. This is a fantastic space which enjoys plenty of sunshine for being in such a central location. The apartment is located just off the courtyard on the same level. Inside the apartment, an L-shaped hallway leads to all of the main rooms. 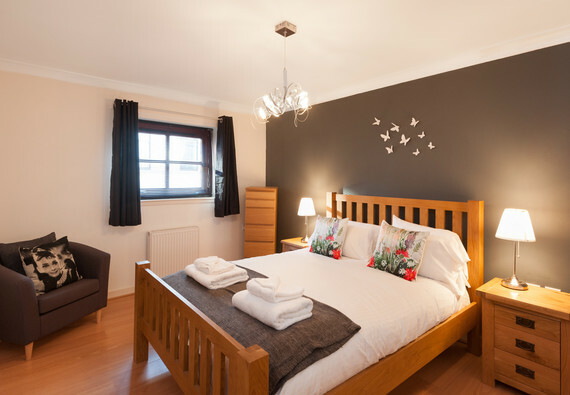 There are two double bedrooms, each with mirrored wardrobes providing plenty of space for guests of longer stays if required. The bathroom is located off the hallway also and features a modern three piece suite and mains shower system operating from the Gas Boiler Heating system. The open plan living area is a bright space thanks to the dual aspect windows within the room. There is a small dining table with two chairs, plus an additional two chairs stored within the apartment. A chic three piece leather suite, a digital TV, and free wifi facilities make the room most comfortable for all guests staying. The kitchen is adjoined to the living area, and contains all modern appliances including fridge, freezer and washing machine. The cupboards are stocked with all essential inventory for home cooking should you wish to do so. Parking notes The property has the added bonus of an underground secure parking space, which is a rarity in this location. Accessibility statement This property is located on the first floor and there is no elevator therefore it is not accessible to wheelchair users. No reviews yet for Greyfriars Court Apartment.